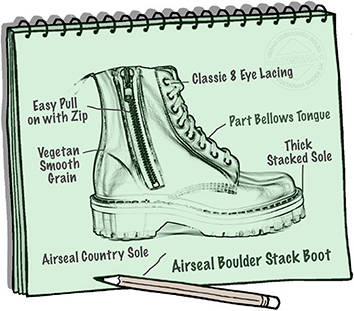 The Boulder Boot is a traditional UK eight-eyelet work boot pattern. With 'part bellows' tongue for increased water-resistance. As well as breathable and water resistant uppers the very finest non-leather components have been selected to construct this footwear. This version also has a zipper for quick and easy pulling on. These extra thick, deep lug, translucent soles provide excellent shock absorption, comfort and insulation and have been made even higher and thicker with an extra layer of cushioning. Soles approx. 32mm thick and Heels approx. 45mm thick.